The Dartmouth and Torbay Railway extended their line from Paignton to Churston (originally named Brixham Road) on the 14th of March 1861 with the extension on to Kingswear opening on the 16th of August 1864. The South Devon Railway worked this line from the start. Churston became a junction in 1868 when the Brixham branch was opened by the Torbay and Brixham Railway. Churston station was at the top of a 1 in 67 rising gradient from Goodrington, with the line falling on to Kingswear at gradients of between 1 in 57 and 1 in 120. Due to these gradients, no carriages or wagons were allowed to be detached and remain on the up main line. A major enlargement of the station area began in 1912 where the platforms and crossing loops were greatly extended at the Kingswear end, and the signal box was resited onto the down platform. Following the closure of the Brixham branch on the 13th of May 1963, the layout of the station was rationalised when one of the branch sidings was removed. The remaining branch sidings were made redundant in 1968 and closure of the signal box came on the 20th of October 1968. In 1972, British Railways decided to close the section of line from Paignton South to Kingswear, however, the Dart Valley Railway Company took control of the line from the 1st of November 1972. Now known as the Paignton and Dartmouth Steam Railway, the experience of travelling through this coastal area behind one of several locomotives that are available, brings delight to many summer visitors. The 4 mile broad gauge single line was leased to and worked by the Great Western Railway until it was absorbed by the G.W.R. on the 1st of July 1843. Originally Cirencester had a small overall roof, however this was removed in 1874 and replaced by the standard platform canopy. The original tall station buildings remained for the whole of the station's life, including a partial rebuilding in 1956 when the same Bath stone was used to maintain the old style. Just before the Grouping of 1923, four additional sidings and a pig dock were added to the east of the original yard. The following year saw the renaming of the station to Cirencester Town. When the threat of closure loomed early in 1959, the Western Region made efforts to increase the amount of passenger traffic to the extent of replacing steam with a diesel rail bus and despite the considerable support of the town's inhabitants, passenger services were withdrawn in 1964. Built on a single-track branch line between Staines and West Drayton, the layout of the station was modified in 1904 with the addition of a passing loop. During the Second World War when the line was used as a freight diversionary route, the passing loop was increased by a further 220 yards. For a down freight - 8 minutes after "train entering section" received. This instruction however did not apply to flocks of animals or traction engines which were not allowed to cross after "line clear" had been given by the Colnbrook signalman. Private sidings were added in 1936 / 7 serving Mssrs. Nuttall and Mssrs. Swan at the West Drayton end of the station. Following the building of a new housing estate, a new halt - known as Colnbrook Estate Halt - was added to the line on the 1st of May 1961, and it was hoped that this would attract increased passenger traffic to the branch, but this was short lived and all passenger services were withdrawn on the 29th of March 1965. The closure of freight facilities followed in the beginning of 1966, except for the private sidings, however the signalbox closed in March 1967 and was worked under shunters control as "one engine in steam". In the early 1980's, removal of the track began at the Staines end, and today just a part of the West Drayton section remains near to the M25 / M4 interchange. The Wycombe branch line ran from Wycombe Junction, just west of Maidenhead, to High Wycombe. Construction of the 10 mile branch used the broad gauge single track of 90� pounds to the yard Barlow rail. These inverted "V" shaped rails were not laid onto timber sleepers but the prongs of the rails were embedded into the ballast. This was found to be unsuitable for heavy traffic as the rails had a tendancy to spread and reconstruction of the track soon followed together with extending the line in stages to Kennington Junction near Oxford via Thame. In August 1870, the line was closed for converstion to standard gauge. The Great Western worked the branch from the outset. A passing loop was added in 1904 and the layout remained static until the end of goods traffic in 1966 when the siding and down spur were removed. In 1970, the branch line was truncated at Bourne End, and since that date, trains have run from Maidenhead to Bourne End or Marlow only. 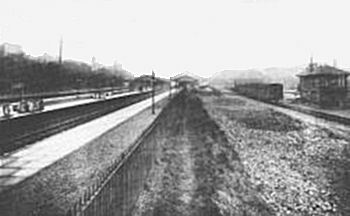 The line from Shrewsbury through Craven Arms and on to Ludlow was opened as a standard gauge single track line on the 20th of April 1852, but was double tracked in 1862. Craven Arms became a junction when the Knighton Railway to Bucknell was opened on the 1st of October 1860 and on to Knighton in March 1861. Initially the Shrewsbury to Hereford line was worked by the contractor Thomas Brassey, but on the 1st of July 1862, the West Midland Railway in partnership with the Great Western together with the London North Western Railway leased the line. The L.N.W.R. also took control over the Knighton Railway. 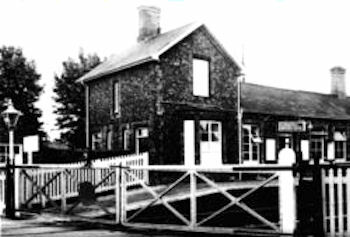 The stone-built station at Craven Arms served a wide agricultural area of small villages which provided the station with large amounts of sheep, poultry and mushroom traffic. Due to the increasing number of passengers, the name of the station changed in July 1879 to "Craven Arms and Stokesay" with huge station nameboards showing the various points that were served. Craven Arms was a joint station by the Great Western and London North Western and the track plan of the station is of L.M.S. origin. Naturally this concentrates on the L.M.S. owned portions of the facilities and the Great Western yard is not shown. This area contained cattle pans, a 200 foot loading bank, a travelling crane that traversed 478 feet of one siding and a five-ton fixed crane. Extensive sidings were available for 180 wagons together with a weighbridge. Extensive modifications to the station area began in 1965 when the engine shed was closed in addition to the Craven Arms Junction signal box. The line from Craven Arms to Knighton reverted back to single track status although today this forms part of the Heart of Wales line. 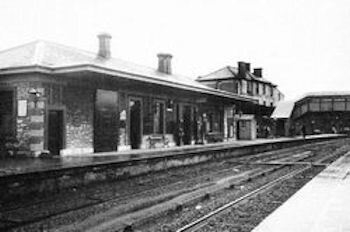 Craven Arms station was also lost all of its original station buildings, replaced by small brick-built shelters. 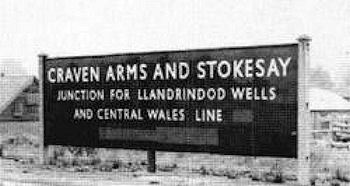 The station reverted to the original "Craven Arms" name in May 1974. Although these scenes of Droitwich are familiar to many Great Western enthusiasts, I felt that I had to include this in my list of favorite stations. 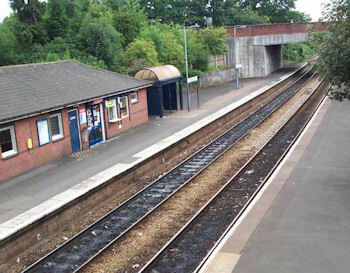 This 5� mile double line section from Worcester to Droitwich and the 4 mile double line branch from Droitwich to Stoke Prior was initially exclusively used by the Midlands Railway. Their trains had reached Worcester by an OW&W branch from Abbot's Wood, 4 miles south of Worcester, on the 5th of October 1850. This new route allowed the Midland Railway to serve Worcester by through trains to and from the north, rather than as a dead-end branch off their main line. However, the OW&W built a 16� double line extension from Droitwich to Stourbridge, and a 10� mile single track branch Noron Junction (between Worcester and Abbot's Wood) to Evesham, and the Oxford, Worcester and Wolverhampton own trains were used on these sections. The Great Western took control of the OW&W in 1863. At one time, Droitwich was the centre of the salt industry in Worcester, but in the nineteenth century this activety was moved to Stoke Works, about 4 miles away. Prior to World War II, Droitwich attracted great attention due to its natural brine baths and many people travelled there to aid their recovery to good health. 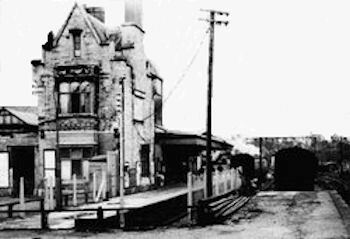 When Droitwich station was rebuilt in 1899, the Great Western to special care to ensure that invalid access and uppermost in the planning. The station name changed in October 1923 from Droitwich to Droitwich Spa. Even after the rebuilding on the station, further improvements were made In December 1904 when refuge sidings were added to the 'up' and 'down' lines to Stoke Prior that held 60 wagons, an extension to the goods shed, new goods offices, additional sidings and a weighbridge. Of the station itself, passenger were particularly well looked after with platforms of 424 feet on the 'up' side, and 458 feet on the 'down' side. The urns, statues and rustic woodwork were almost unique on the Great Western and demonstrated the GWR's attempt to match the character of this historic spa town. In the 1960's the reduction in the goods traffic carried by the railways meant inevitable changes to the layout at Droitwich. The refuge sidings on the Stoke Prior branch were removed in 1961, and by 1967, the conversion of Droitwich from a general goods depot to a coal concentration site had been completed, however, a further sign of the reduction in rail traffic, the Stoke Prior branch was singled in 1969. 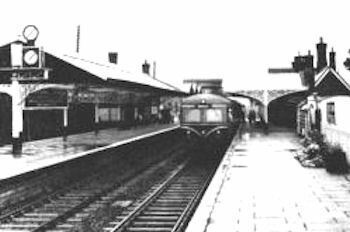 When the Great Western opened their line from Paddington to Maidenhead on the 4th of June 1838, Ealing Station, as it was originally named, was not yet ready but opened in December of that year. At this time, Ealing was just a small village surrounded by fields, and even the census of 1841 showed a population of just over 8,000. Built as a double track layout - broad gauge of course - the track was quadrupled between Portobello Junction and Southall in 1877. 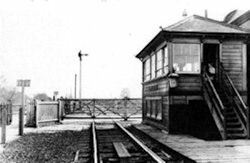 To cope with increase in rail traffic, a new signalbox was installed at Ealing. Until 1863, the GWR's double line sections were worked under the 'time interval' system, however, the block working method was gradually extended and the Paddington to Ealing line was fitted with disc block instruments in 1867. The Ealing to Southall section was not supplied with this equipment until 1871. Introduced from February 1871, block working permitted the signalman to give 'line clear' on the single needle or disc instrument when a train had entered within the protection of the home signal, providing that the signalman has ensured that the whole train had arrived. This arrangement did not apply in foggy weather when the signalman could not see his distant signal and the line had to be clear through the length of the station. At certain stations where the signal position meant that the signalman could not see the signals clearly, ot if the line into the station was on a falling gradient, the block method was not used. On the 1st of July 1879, the District Railway opened their three mile branch line from Turnham Green to Ealing and the new station at Ealing can be seen on the right of the top picture. An overbridge was installed allowing access to the District Railway station, however in 1912 the overbridge was replaced with one that permitted the use of up to ten lines of GWR rails, however in the end, the bridge only crossed eight GWR lines. Ealing station was renamed Ealing Broadway in 1875. Originally planned in 1905 but delayed due to the First World War was the opening of the electrified Ealing and Shepherd's Bush branch of the Great Western utilising the space between the Great Western main line tracks and the District Railway station at Ealing. It was originally intended that Shepherd's Bush would be a new suburban terminus for Great Western trains, however this plan was abandoned for an end-on junction with the Central London Railway at Wood Lane. 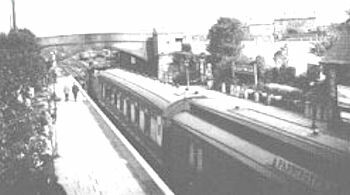 The Ealing and Shepherd's bush line opened in 1920 but passed to London Transport management on the 1st of January 1948. During World War II, Ealing Broadway was a major staging post for the evacuation of children from the London area. At the end of hostilities, several major improvements were made at Ealing Broadway. 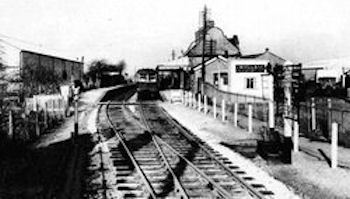 Firstly the station was coverted from gas to electric lighting in 1947, however the signal box closed in 1955 with control passing to West Ealing and Acton West boxes. In 1964, a �700,000 rebuilding plan was approved where the booking facilities for both British Railways and London Transport were centralised in a glass-fronted area above the ex-Great Western station, complete with a nine-storey office block and several shops. 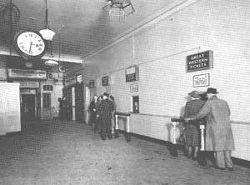 A further �400,000 rebuild of the booking hall was made in 2007 / 8.